In a sleepy village in Pasig City, townhouses stand next to each other on both sides of the road, forming a cookie-cutter-type setting. But nestled amidst one of identical rows of residences is an unexpectedly chic home, a little white gem in this suburban subdivision. An energetic young family lives in this gem of a townhouse. Looking at the home now, it is hard to imagine its former state—it had a pretty straightforward layout, a cramped staircase, and tiny dark rooms done up in a dated, 1980s style. The family called on modernist architect Ed Calma to redesign the space, and though the planning took six months, the renovation itself stretched over a few years. Calma first opened up the cramped quarters by gutting out unnecessary walls and removing outdated bat windows, replacing them with aluminum-framed sliding doors that let in a lot of light. He then used a subdued interior palette of white, accented with black, camel, and dark brown, and filled it with iconic furniture that are known for their sculptural forms. The stunning end result is an airy, clean-lined home that is practical and comfy enough for this family's active lifestyle. On the ground floor, there is an open-plan living and dining room now awash in natural light, and built-in units for entertainment and storage that disappear into the walls. The staircase is now a minimalist space that leads to the second-floor bedrooms. 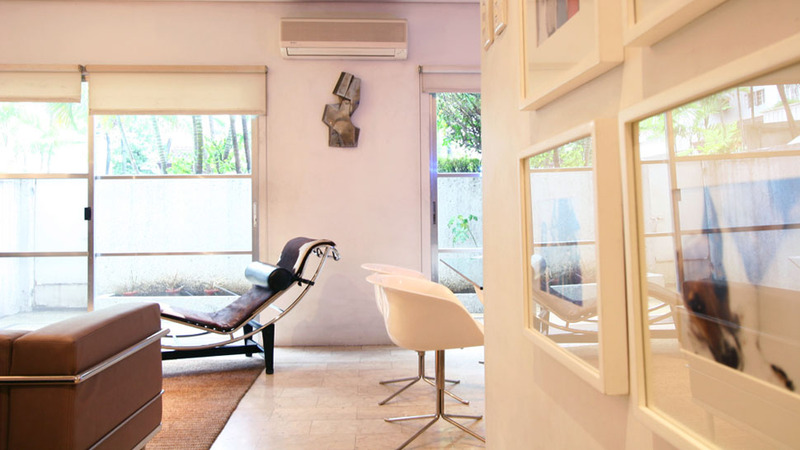 Calma also went through the homeowners' collection of art by contemporary Filipino masters and National Artists like Bencab, Jose Joya, and Ang Kiukok, and used their works as bright spots of color to punctuate the predominantly neutral home. Now the homeowners admit looking forward to going home to this townhouse everyday. Who wouldn't, if you had such a white hot space?